Leave the Pen y Pass cark park by the top right hand corner and the path is visible before you. It climbs steadily up to pass between Crib Goch and Bwich Y Moch. The path then flattens out and offers views over Llydaw with the Miners Path now visible below as it crosses the lake by a causeway. At the fork keep left and go over the style. The right fork leads to Crib Goch which a serious knife-edge walk and not for the faint hearted (look it up on You Tube). The path continues and the Miners track will join from the left (note the stone marker as this will be your descent route if you are taking the other path down) before turning right at Lake Glaslyn and then pushing on upward for the second ascent section where many climbers will take a rest and maybe question their sanity for taking on this challenge! But don’t give up - it will be worth it. Eventually the path joins the Llanberis Path again note the stone marker at this point as it is where you will turn off to descend. Continue to the summit following (but not on) the rail lines, and enjoy the views and a cuppa in the summit cafe. Follow the rail lines on the Llanberis path to the stone maker you noted on the way up and turn right. Again follow the path and keep an eye on your map and look out for the other stone marker which indicates the descent down to the Miners Path which you may have noted as other climbers joined on the way up. I n truth after this ‘scrambley’ descent on which I would advise you to take your time and great care, it’s pretty much plain sailing although there is one more smaller downward scramble between the levels of lakes Glaslyn and Llydaw. 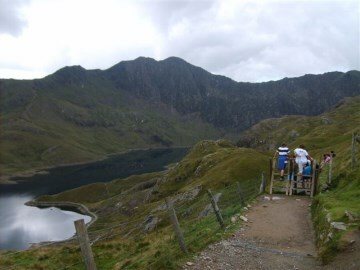 The path goes along the lakes and looking back gives great views of Snowdon if conditions permit, before crossing the causeway and going away from the Pyg track. 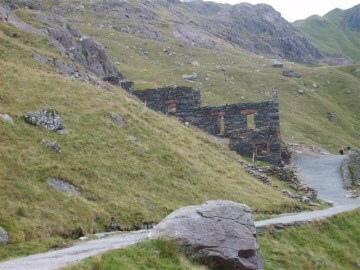 As you pass by some disused mine buildings (these are the buildings of the old Brittania Copper Mine) the going is now easy all the way back to the Pen y Pass start point. There are facilities at the start of this walk and a café at the summit, however dependant on circumstances and the season it is possible that they may not always be open so best to check beforehand. They are both on the pricy side and neither allow you to consume your own food on the premises but you may use the toilets. If God forbid you are in trouble when you reach the summit it may be possible (subject to availability) to get a ticket for the train down to Llanberis and then get the Sherpa back to Pen y pass, but let's hope that's not necessary! 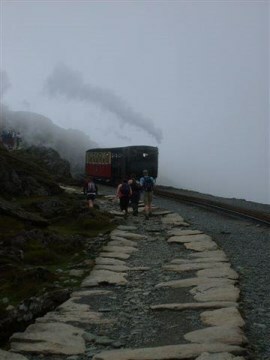 The Miners and Pyg Tracks up Mount Snowdon are popular walks. 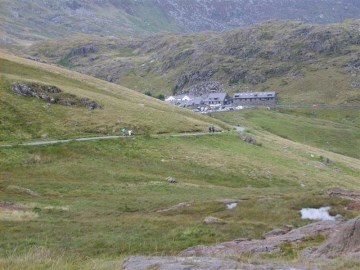 The Pyg Track is around 3 /14 miles to the summit, and the Miners 3 3/4 miles. Many thanks to Ray Jacob who has provided a personal account of the paths which will give you an idea of what to expect. 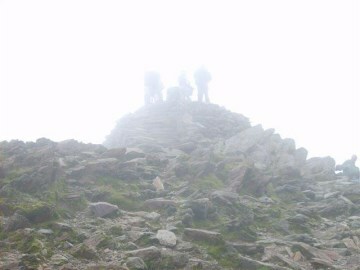 Yes it’s a mountain, yes it’s a tough walk, (what would be the challenge if it wasn’t?) but please don’t be put off. Both paths are manageable by persons of reasonable fitness provided you prepare properly, food, good boots, water, appropriate clothes etc. One final thing I do have to bore you with is that I can vouch from personal experience that Snowdon conditions can change literally in seconds. If it’s your first time, try and pick a day with a reasonable mountain (not the regional) weather forecast, although there are still no guarantees. Also make sure you will have enough daylight to complete the journey as even for a fit agile climber it’s likely to be a good 5 hours. Just take your time, it’s not a race and when you feel the need to stop and rest then do just that. The first time I did it I wondered what all the fuss was about, it was a brilliant day and I questioned why I was carrying so much stuff, but last year after a light drizzle start, and some sunshine toward the middle section, the cloud dropped suddenly on the final assault and I was hit by almost zero visibility very strong winds out of nowhere and freezing rain stinging my face. Luckily it passed almost as quickly as it came but be aware this can happen. If you don’t use your gear that’s great, but please take it. Although the paths are well marked in mist it is easy to become disoriented, so a map, compass and GPS is still essential. 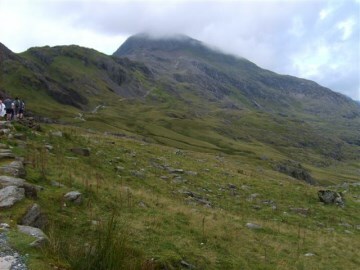 Both paths start at Pen y Pass Youth Hostel (A4086 Llanberis Pass), but if you want to use the car park (cost around £10) get there very early. There is a free lay by car park another 1.5 miles or so on toward Llanberis and if you don’t want this to add another 3 miles to your walk, there is a Sherpa bus stop here and you can get the bus back to here after your walk. The Sherpa buses operate out of Llanberis around Snowdon so it’s worth looking on the Sherpa web site for information if your future planned routes ascend from and descend to different places. Once at the Pen y Pass car park the Pyg Track starts by leaving by the top right hand corner of the car park (sign posted), and if you want to take the Miners Path, walk a few yards back towards the south east and a gate marks the start. The Miners is the longer of the two routes but is very gentle from the start and for much of the way. It has a very good well defined path which, after a somewhat boring start, gives some iconic views of Snowden reflected in Llyn Llydaw (weather permitting). The down side is that it obviously has to ascend to the same height as all the other paths, so no prizes for guessing that the last section is steep, demanding and the path not so well defined as it requires clambering over a rocky section. 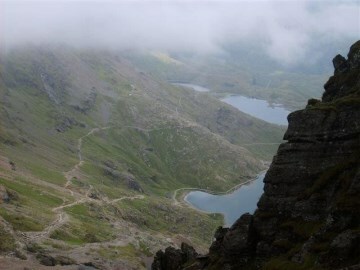 The Pyg track ascends in two main sections separated by a welcome flat section with great views from a height firstly down the Llanberris pass and up to Crib Goch then Llyn Llydaw, Llyn Glaslyn and eventually the summit. 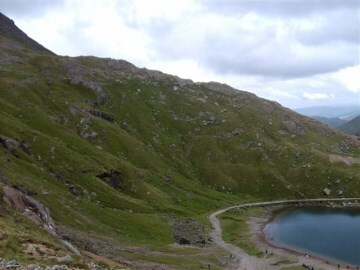 Also the Miners track is visible at Lake level and this will later ascend to join this paths. Both paths, after another rather steep section, will join the Llanberis Path to push on to the summit following the railway lines on which the Snowdon Railway carries the lazy people (that’s just a joke honest!). Which to choose? Up to you really, but as they start and finish at the same place why not do one up and the other down? Both paths have some individual views and my suggestion would be the Pyg up and the Miners down. The reason is that the descent is quicker using the Miners Path and once at lake level, apart from one more minor downward scramble, the remainder is quite gentle and the path easy to follow leaving very little chance of going wrong if conditions change or light begins to fail. Thanks again to Ray for providing his description of the walks and the photos.